The IRS uses the series of Notices CP75 (CP75A, CP75C & CP75D) for letter audits concerning the Earned Income Credit, The Head of Household filing status, or Dependency Exemptions. (See examples below) Usually, the IRS will ask you for documents & information with Forms 886-H-HOH, 886-H-DEP, or 886-H-EIC or they may include a separate Form 4564 or Form 886A. In most cases, you must 1st verify that you are entitled to claim the dependent & the corresponding various benefits. The IRS asks for a lot of documentation showing your support of the dependent, which is a very tedious chore. Fortunately, the TaxHelpAudit Program makes it easy with sections devoted to the Dependency & Personal Exemptions, the Earned Income Credit & the Head of Household filing status. This is not an audit or a bill but the issues must be proven in exactly the same way. You only have 60 days to respond through the IRS administrative process. The information requested by the IRS is very personal & they often ask for far more than necessary to prove the case or to which they are entitled. But, you have a duty to prove your case. The IRS will ask where you lived, with whom, how much were contributions to the household & your lifestyle. You must get housing, school, medical, court, agency, & government records to verify your claims. 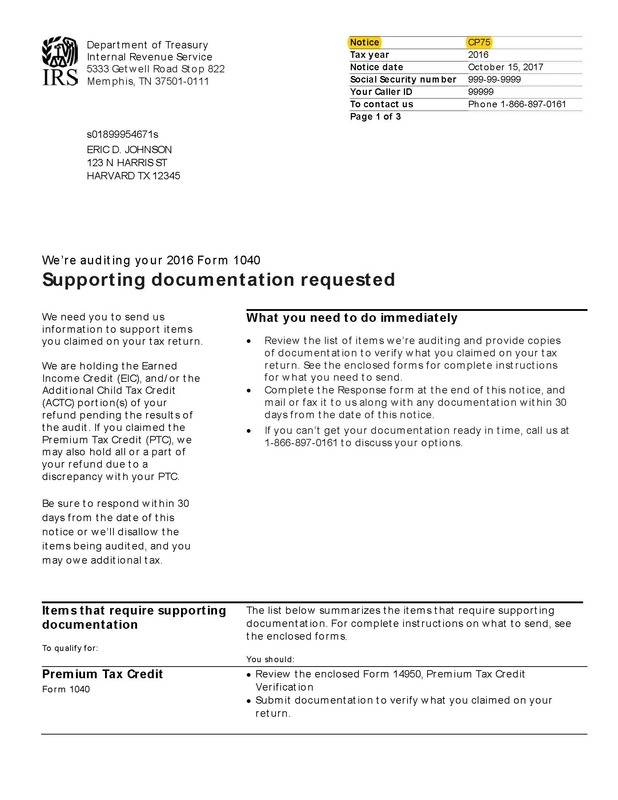 These documents must be prepared in the manner required or the IRS will reject them. Also, the IRS will not review files that are unorganized & they will likely impose "negligent record-keeping" or "accuracy-related" penalties for poorly presented records. So, you have to get the documents & you have to organize them correctly or you lose. The TaxHelpAudit Program shows you how to easily do both! Please look carefully at the Notice CP75 you received from the IRS. If it involves no other issues than the Earned Income Credit, the Head of Household filing status or a Dependency Exemption then you only need the TaxHelp Individual Edition Prep Steps. To see how the TaxHelpPrograms work see our Empowerment page! Lost Documents: You may fear an IRS audit because your records are lost or unavailable or you didn't keep your papers. However, unless you only used cash for all transactions, bank records & credit card records can be re-created. But, even if cash was used, affidavits can be obtained or we can use industry standards to arrive at a reasonable figure. See TaxHelpLaw - Lost Documents. Since an IRS audit is a Federal legal investigation of you, attorney guidance is recommended even if you don't hire the attorney. The TaxHelpAudit Program gives you tax attorney guidance for IRS audits while the TaxHelpLaw attorney, J. David Hopkins, JD, LLM is ready for specific legal advice.